New car out of the showroom also has audio.Akan device but for some people, the standard audio system equipment from manufacturers such as single-DIN head unit and four congenital and two-way speakers will suffice. However, for music lovers feel less need to upgrade. The important thing to note is the selection of products, gadgets and more importantly is your favorite musical genre. 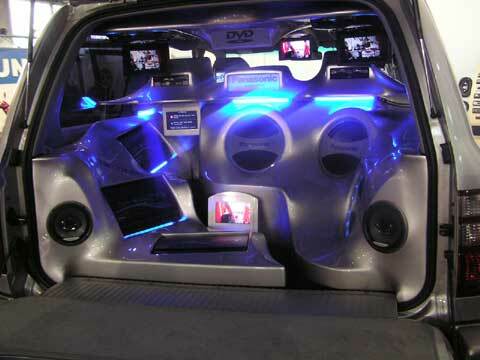 The main thing is how the audio devices that can be applied without reducing the comfort of the cabin. Here are tips to improve the standard audio. Make sure the unit as a sound source playback device, usually equipped with features CD Player, MP3 Player and DVD Player which can be a single type Double DIN, or DIN. Usually the factory berepurasi clearly outlines the product specifications. This will greatly help you choose a good head unit. For sound quality, select the head unit with four-channel sound capability (two rear and two front) of at least 30 watts per channel, plus features RCA outputs which would be very useful if you want to add a crossover or power amplifiers. This tool as a means of support from the head unit that serves to generate electrical signals converted into sound waves. To determine the quality of the speaker's voice. This is usually the order changes with the addition of split-sound speakers standard exhaust and a few other supporting devices. The function of the mid-tweeters and speakers produce treble sound and vocals and sound effects to explain. In addition to adding components to compensate for the bass sound quality speakers split circular rhythm, the device is reliable subwoofer. Choose the type of subwoofer is easy to apply in this case the dimensions do not be too big. But the most important aspect of sound quality. If you want to enjoy a song with a thumping bass and clear round, should the addition of one more device, namely the Power Amplifier. Choose which can send voice between 25-40 watts per channel for each channel 4 ohms with a frequency range between 20 Hz - 20 kHz and THD (Total Harmonic Distortion) less than 0.5 percent. With the system channel settings (channel), ie, two channels on the front speakers and two channels for the subwoofer. Another factor to consider is the quality silencers. And most important, though minimalist in appearance, function as well as everyday vehicles, are not disturbed.